There are many qualities that make a leader, yet few are able to combine them in a way that inspires others to achieve. WA Business News’ 40under4O aimed to find WA’s top young business people in recognition of their success. THE 400-strong attendees of WA Business News’ 40under40 Awards night enjoyed red-carpet style and service.In this special commemorative edition WA Business News showcases a snapshot of the excitement, energy, and entrepreneurs that made the annual awards evening a much-talked about event. 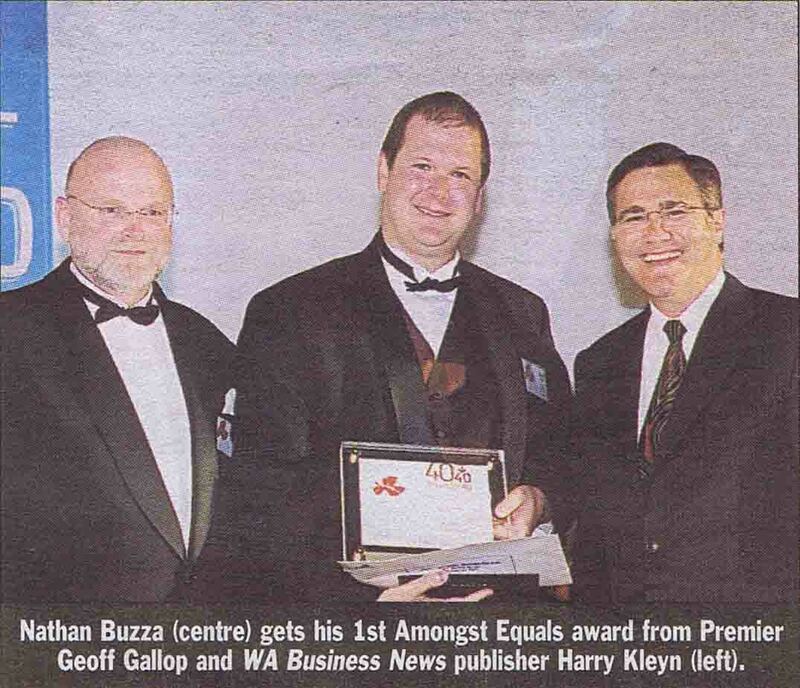 Presenting the 1st Amongst Equals award (awarded to one person that has the qualities to galvanise the group) premier Geoff Gallop said the future health of WA’s economy depended, to a large extent, on developing new ideas, encouraging creativity. supporting ingenuity and promoting drive. “I congratulate WA Business News and all the sponsors for their foresight in recognising and promoting WA’s future business leaders on this occasion tonight,” Dr Gallop said. Each of the 2003 40under40 winners showed their own brand of entrepreneurial brilliance and leadership ﬂair. The 40 winners included 11 women and the average age of a 2003 40under40 winner was 36. The youngest winner was Vanguard Floating Production Australia facility supervisor Captain Suzannah Vaughan who turned 30 after the close of entries. The 2003 40under40 winners came from a wide array of industries. Because of such wide variation there was no clear defining industry for the group. Those industries tallying more than one person included fields such as mining, construction, manufacturing, and health product development and research. The information technology and finance sectors delivered the most winners with four coming from each industry. Other sectors that provided more than one winner were the hospitality and public relations industries. Nearly 60 per cent of the winners were degree qualiﬁed, however, several business owners operating multi-million dollar turnover companies listed TAFE courses as their highest qualiﬁcation. Seven winners obtained qualiﬁcations from overseas institutions and two studied at institutions on the eastern seaboard. Three of the winners held doctorates and five had completed a Master of Business Administration. Seven held a bachelor of business degree. Twenty eight of the 40 winners founded their business (either on their own or with one or more person) and they collectively employ 1,067 people. Of the winners, 78 per cent were in a managing director’s role or equivalent. Copyright © 2019 Nathan Buzza Creation / All rights reserved.